I went into this one full of trepidation. We have seen many spy comedies before and the vast majority are unimaginative slapstick duds. On top of that I’m not really a fan of the gross out/foul-mouthed humour which McCarthy and Feig (Bridesmaids and The Heat) are so well known for. However I’m happy to admit that I was taken aback by their latest effort which combines endless oneliners with real pathos and explosive action. 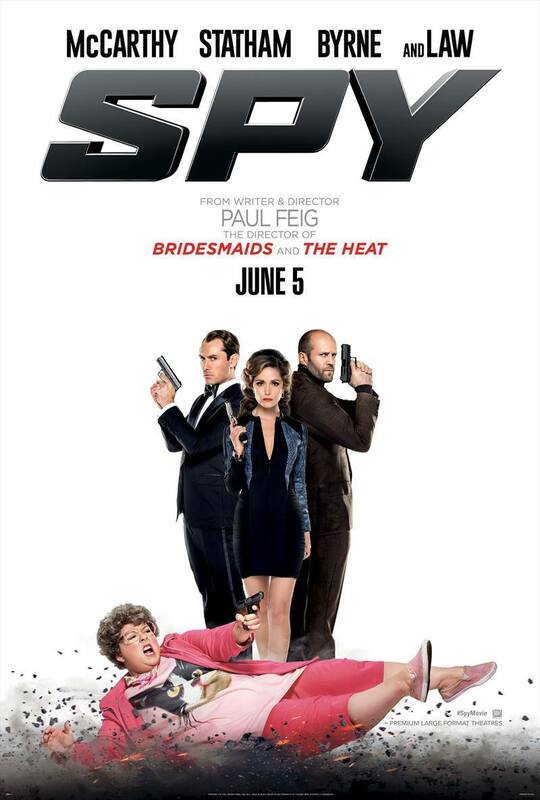 There’s still enough of their trademark humour to appeal to their fans but overwhelmingly it playfully riffs on the spy genre and its lead stars, never once asking us to laugh at the fat girl but instead making her the most competent spy of them all. Melissa McCarthy is very strong in her lead performance here. She manages to convince as both the put upon nobody who is just wasting away in a basement and also as a very competent spy who believably can take down a room full of assassins. 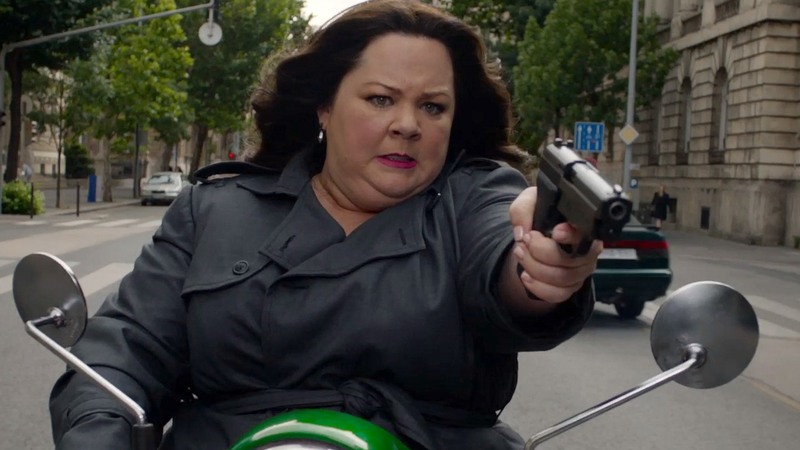 She is rarely graceful in her action scenes but the joke isn’t that her bodyshape is ‘overweight and silly’ as so many exploitative comedies would have made it but instead it’s used to highlight how ridiculous the athletic behaviour we normally see in spy films really is. She also has to continuously alternate between playing the fool and the straight-guy which is no easy challenge and she does so with disarming ease. Opposite her are a real feast of ridiculous characters that are lots of fun to watch; Jude Law plays a narcissistic CIA agent who believes he is Bond, Rose Byrne plays a dry and delightfully cutting villainess and Jason Statham sends up his tough guy persona as he continuously makes more and more outrageous claims about all of the intense things he has done ranging from a high speed chase whilst burning alive to reattaching a severed limb whilst on a mission. It’s silly but it works very well. One of the weaker areas here is the plot. It’s a simple one about some villains who want to do evil things for an unexplained reason. We learn that McCarthy’s character is a trained agent who has for whatever reason ended up with a desk job in the basement, never to be thought of again. However when the villains suddenly gain intelligence on the CIA and know who all of their field operatives are the agency are left with no choice but to go with the inconspicuous and unknown McCarthy. From there all sorts of mishaps, fight scenes and jokes ensue in a paper thin plot. It’s the sort of thing we have seen many times before, which is a shame. It could have really benefited the film to have had a stronger and more original story to go with the great performances but I guess it can be argued that the plot isn’t really the most important element here. It’s more of a tree on which to hang the endless jokes and gun fights. I’m not going to make a big deal about the toilet humour element to the film. I don’t like it and I think it takes away from a lot of the film’s more intelligent comedy, but I’m aware that there are many people who really love that style and are going to find this hilarious. What’s worth taking away is that regardless of whether you’re for or against it you’re likely to get a lot of laughs out of the film because there really are a lot packed in here. Spy is the kind of film which I don’t really see being too well remembered in years to come; it isn’t very subtle and many of its jokes are funny but you’ve forgotten most of them by the next day. That being said though I was thoroughly and pleasantly surprised that I had a really good time with it. It made me laugh, the action is more intense than I had reason to expect and Feig and McCarthy find the perfect balance of comedy and action to make this really work. What is the film’s greatest strength? Melissa McCarthy’s very nicely balanced performance. Its greatest weakness? The script could have been a bit more inventive. Would I see it again? I had fun but I doubt I’ll revisit it. Certainly not for some time. I can understand. Thankfully I have skipped a few of her recent ones so I went in fairly open minded! I am hoping to see this over the weekend. It looks like fun. I had fun with it despite all of my expectations so I hope you do get to see it! Very surprised at the reception for this film. I’m intrigued. Haha yeah I know! I guess it’s partially because lots if people went in not expecting to like it and were surprised. It won’t win any Oscars or anything but it was good fun.